Learn how AMPS can help get more life out of your existing messaging system. 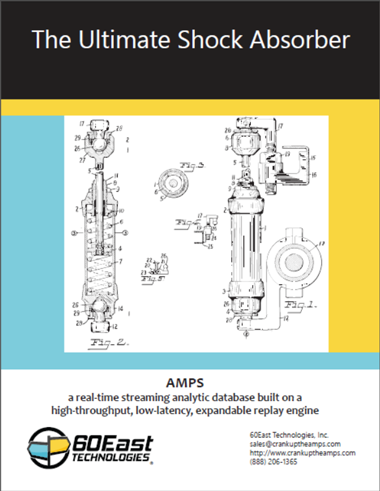 The capabilities that make AMPS a world-class messaging system in its own right -- stunning throughput, expressive filtering, high availability, slow consumer protection, and unlimited record-and-replay -- also make AMPS perfect as a shock absorber for existing messaging systems. This white paper describes what makes a good shock absorber, presents how the capabilities of AMPS can be used as a shock absorber, and shows the kind of performance data 60East measures when testing customer scenarios using AMPS as a shock absorber. Click here to download and start reading! If you're ready to CRANK IT UP, here's the information you need to get started. Choose the guide you're looking for, or download a ZIP file with all of the docs.